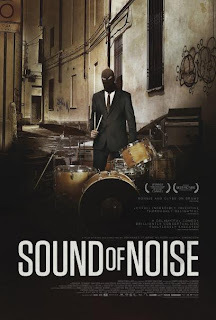 So it is with some pleasure that I watched the guerrilla percussion group in the Swedish film SOUND OF NOISE interrupt a boring concert-hall performance of Haydn's Symphony No. 94 (“Surprise”) with a genuine surprise – bulldozers rhythmically thumping the ground and destroying a fountain in front of the concert hall, sending the panicked audience members rushing out of the building. The film, written and directed by Ola Simonsson and Johannes Stjärne Nilsson, seems to grow out of a rebellion against the strictures of classical music. Both the avant-garde musician villains and the Javert-like policeman pursuing them are reacting in different ways against the confinement of traditional music. The police inspector, who bears the semi-Mozartean name Amadeus Warnebring, is the scion of a famous classical music family – his father, and now his brother, are famous conductors, his mother a classical pianist. Warnebring describes himself as “tone deaf since birth,” a condition that, in this movie's whimsical conception, means that he finds all music intolerable and sometimes inaudible. So it is the film's ironic conceit that it falls to Warnebring to crack the case of the rebellious musicians, led by Sanna Persson (played by the Swedish comedienne and actress Sanna Persson), a onetime conservatory student who was expelled for flooding the school as part of a conceptual composition incorporating the building's sprinkler system. Persson and her musical partner, Magnus (Magnus Börjesson), a fellow lapsed conservatory student, enlist a group of talented, disaffected drummers to perform his magnum opus, a massively scaled John Cage-like piece titled “Music For One City and Six Drummers.” The composition involves the “playing” of common objects around the unnamed city, ranging from a human body to electrical power lines. It is part of the film's charming design that the composition is first brought to life visually, with animated drawings that leap out from the staff paper. This is also symptomatic of a flaw shared by many films, a setup that's vastly more interesting than its subsequent execution. Granted, the dynamism of the opening sequence would be hard to match – it juxtaposes Warnebring's personal narrative with the thrilling, primal soundscape of Magnus drumming madly in the back of a van while Sanna drives. The pair are musical terrorists, confounding the cops by throwing drums at them on the highway. The ticking of their metronome becomes an auditory analogue to a bomb. Once Sanna and Magnus have recruited their percussionists, in an amusing sequence that depicts them thumping away at their boring gigs, the performance of the actual piece is sort of beside the point, not to mention surprisingly destructive. The first movement takes place at a hospital, where the musicians, improbably, impersonate doctors and “play” music with medical equipment and upon the abdomen of a gasbag TV star who has been hospitalized for rectal surgery. Setting aside the impossibility of making rehearsed music with respirators and adjustable operating tables, the enterprise seems needlessly cruel. It's also rather pointless, since there is no audience for the music. The composition's later movements, at a bank, the aforementioned concert hall and city power lines, are similarly baleful, making it difficult to sympathize with their rebellion. "Music For One City and Six Drummers" is a piece that would be more interesting if left on paper and unplayed; in execution, it leaves the realm of creativity and becomes vandalism. We warm to the awkward Warnebring, on the other hand, as we watch him contend with the snobbish contempt of his brother's musical circle. Warnebring's aversion to music, engendered by his parents' pushing him to take piano lessons, is so extreme that he dreams of “music made of silence.” He is also literally deaf to the voice of anyone whose body has been “played” by the guerrilla drummers. To catch the renegade musicians, Warnebring must make some rapprochement with music, fighting fire with fire, measure for measure. Complicating matters is his burgeoning attraction to the pretty, headstrong group ringleader Sanna. 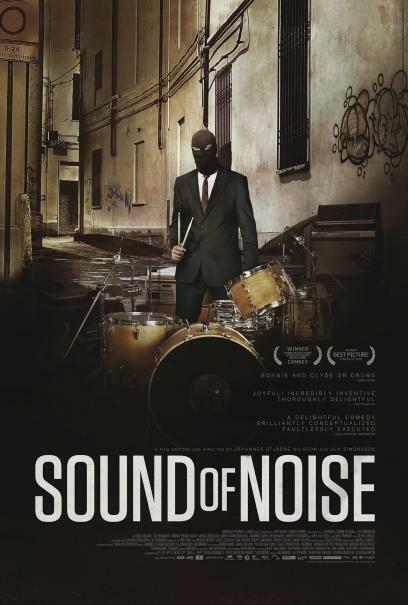 This is a clever and entertaining film, with an arresting sound design and insightful things to say about music. Its exciting premise, unfortunately, has nowhere to go except into predictable Euro-style whimsy. Still, it's a pleasant and interesting ride. 3 1/2 out of 4 stars.